Secuirty operatives inspect the overturned vehicle along the road. Courtesy photo. Gulu: The Regional Internal Security Organisation (RISO) officer attached to Acholi sub-region and his deputy narrowly escaped death when the vehicle they were travelling in veered off the road and overturned several times. The Saturday accident occurred at Loi village in Ligiligi Parish in Agago District just a few kilometers to Adilang trading centre where President Museveni was officiating at the opening of David F Medical Centre. 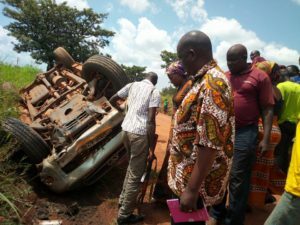 The vehicle that was carrying both the RISO, Captain Joseph Kabalega Akiki and his deputy, Ankunda Deborah, reportedly overturned after it failed to brake upon hitting a pothole. Both officers were rushing to the venue where the President was expected. Ankunda, who was complaining of leg and chest pain, was rushed to David F Medical Centre for treatment before being transferred to Gulu for more medical attention.